Welcome to Papercraft Scrapbooking Magazine Blog Hop. You should have come from Annette Witherspoon’s blog. Don’t worry if this is your first stop. I will list all the participants towards the end of the post. It all started with playing Tuesday Trigger at Moxie Fab world for me. I looked forward to playing along the challenge every week. What an excitement when I saw my name in honourable mention 🙂 Then more when my card was the winner. This gave me confidence about my work. It was one of my goals to get published in the prestigious Papercraft magazine. After a few attempts, my work got accepted. That thrill of waking up to see Susan’s acceptance email, wow! I can never forget that 🙂 I am one of the lucky ones who got published many times at Papercraft Magazine when they were in print. I am forever grateful to the publication because my work got noticed in the craft community. I came to know of lot of designers, made friends, got into design teams and learned a lot in the process. I am so sad that the legendary magazine is closing down but the memories of being part of it will always be with me. This is one of magazines where my card made it to the cover. Here is my thank you card for the entire Papercraft Magazine team. Now head over to Laura William’s Blog next in the hop. Here is the list of all the participants in the blog. 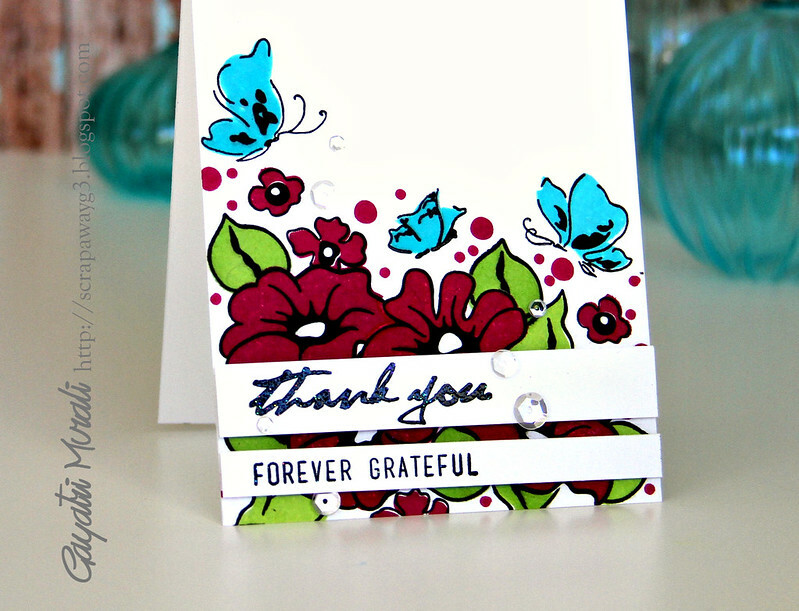 Lovin' all of your gorgeous cards gayatri! Your cards are gorgeous!!! Love! Lovely cards Gayathri. Looks like PC&S has supported the creative geniuses of a lot of crafters like you. Thank you for inspiring us all. Beautiful card, and a nice walk down memory lane! Lovely tribute to PC&S! Love your cards – so pretty! As always your cards are beautiful. I still have that issue with your card on the cover!! Your cards are always so bright and fabulous! LOVE those bold blooms, so gorgeous! A nice tribute to a great magazine. I will miss PC&S as they were such an inspiration to me. Your card and the colors you used are beautiful. Your cover card and today's card are both BEAUTIFUL! Very stunning. I love the use of white space with the brilliant colors. Love it. Oh em gee—your first card in SIT was one of my all time fav cards, and I truly love your second card!! Very pretty!! Wonderful cards! It's bittersweet to get to visit the blogs of so many whose creations I've loved seeing in Paper Crafts mag and that have inspired me! Such beautiful cards Gayatri! It is amazing how this magazine has touched us all. I love your bright and beautiful card! It's stunning! Oh wow, your card is stunning! Your flowers are so bold and vivid! Love it!! I loved reading your Paper Crafts story also. Your card is so beautiful! You put the sequins and bling in exactly the perfect places. I started with the Tuesday Trigger challenges, too. They gave me the confidence to submit. So beautiful, Gayatri! You always rock Altenew 🙂 And I loved reading your post. What a bright and happy card! Love those pretty flowers! Love your style and bold colors! Thank you for being a part of this blog and making us feel loved. Beautiful cards Gayatri! I remember being so excited when i saw your first pub my friend. Amazing!! I have thet mag and flagged your awesome card. LOVE it! Beautiful words, beautiful card, Gayatri! Love your words Gayatri! Love your beautiful card as well!!! Both the cards shown are very pretty! The coloring in the first card is soo calming and classy. Thanks so much for sharing. These cards are just beautiful! Love your gorgeous card, Gayatri!